With the release of their fourth studio album, Angles, New York’s favorite rock and roll band The Strokes are gearing up to play a sold-out show this Friday at Madison Square Garden. But are they ready for such a massive audience? Absolutely. With a solid back catalog and a handful of bright, shiny, and eclectic new tunes, this band is bound to rock. Angles mixes classic Strokes sounds with a little synth and some throw-back 80’s sensibility. 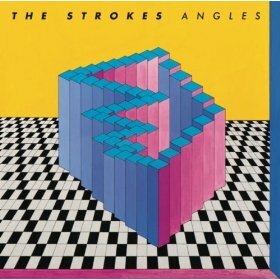 Classic Strokes tunes, like “Gratisfaction” and “Life Is Simple,” are fun, catchy, post-punk songs that get two thumbs up for quality, but don’t really seem to expand their sound so much. That’s where “Machu Picchu” and “Games” come in. These tracks, in addition to a few others, are a huge departure for the band. They are incredibly synthy and could very well belong in a John Hughes movie soundtrack. They aren’t bad, necessarily, but they don’t really fit in at all. “Two Kinds of Happiness,” is a fun up-tempo song that alternates sounding like The Cars to sounding like a U2 B-side. Despite its derivative quality, it really is a great song. But the standout track by far is “Taken for a Fool,” which they recently performed on Letterman. This song has such an epic, anthem quality to it in every possible way. Frontman Julian Casablancas’ sleazy Iggy Pop-like croon is smooth with a hint of cockiness, because I’m sure he knows just how good the song really is. With Fabrizio Moretti’s smashing drums and Nick Valensi’s simple, yet ridiculously addictive ringing guitar hooks, this song is bound to be a Top 40 hit. And perhaps they know it too, as Casablancas sings, “I hope this goes over well, on the toxic radio.” Toxic indeed—you guys are killer.